Bobbi Brown has always killed it when it comes to lipstick formulas, with a huge shade range that caters to a vast number or skin colours and undertones. 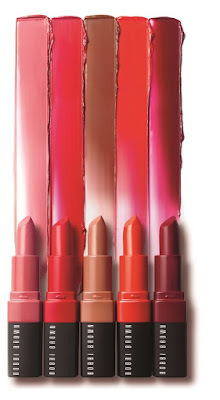 I’ve long been a fan of their matte formulas, but have recently fallen in love with a whole new category – the stain/lipstick/balm hybrid that is Crushed Lip Color. The brand calls Crushed Lip Color a “stain-lipstick”, and it definitely leaves a stained flush of colour that doesn’t dry out and feels almost balm-like at first swipe. Inspired by the effortlessly cool and easy beauty routines of the company’s girl crushes, it pairs a beautiful soft, matte pigment with a blotted down finish for a lived-in look that lasts all day. The perfect weekender, the new formula glides on comfortably, and leaves lips hydrated, soft and smooth with Vitamins E and C and beeswax. As it’s super-pigmented, the balmy texture easily covers lips in a single swipe, and it comes with the promise of eight hours of “feather-free, fade-proof” wear. I have found that fading – or at least, a little diffusing - does happen after a long day going about my business, but it fades evenly and beautifully in time for another swipe. This beauty is in store now with an RRP of $58.00, and in twenty beautiful shades like Bitten, Crush, Blackberry and Grenadine. Just gorgeous. You can pick up your own Bobbi Brown Crushed Lip Color at all Bobbi Brown Cosmetics Counters and online at www.smithandcaugheys.co.nz/BobbiBrown and www.farmers.co.nz/BobbiBrown.